Living in an Urban City is different than living in the Rural Country, in a few ways. Civilization and Wilderness both have advantages and disadvantages when contrasted with each-other (pros and cons). People that love cities tend to focus on night-life, restaurants, and dependence on technology. People that love the country tend to focus on tranquility, nature, and independence from artifice. Fans of both often talk about their flow within the setting, and desired emotions evoked. One of the major planning issues has become Suburban Sprawl. 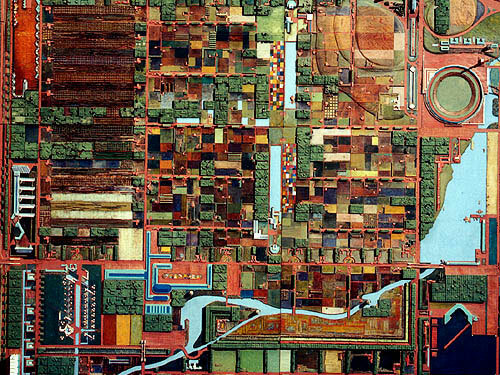 Frank Lloyd Wright was one of the first American architects to address the problem of sprawl in his Broadacre City design. 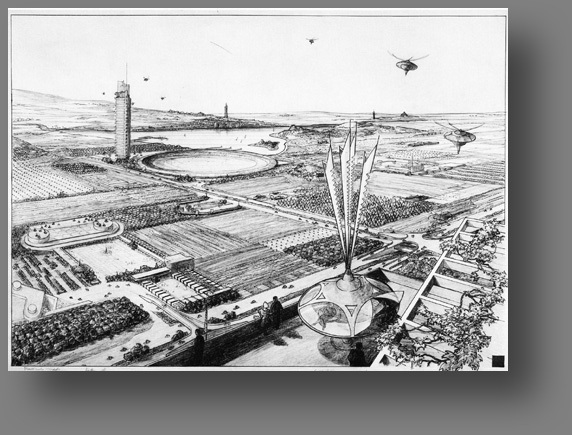 Broadacre city was a modern blend of libertarian and futurist urban, industrial, and agricultural aspects important for civic functions. Savannah has the historic integrity of an ivy-league campus, yet for the poor as well as rich. Yes, it is very much the old pirate ‘Port Royal’ still, but in some ways it also surpasses the nobility of elite university campuses. Even the SCAD (Savannah College of Art & Design) campus is spread throughout the city, and SCAD classes are held in renovated industrial buildings, often with Richardsonian strength; so that liberal education is fully-integrated with the city. As far as competing with modern industrial metropolitan cities, Savannah has plenty of modern and post-modern architecture, and SCAD teaches cutting-edge technology; but it has no desire to be as massively impersonal as New York, or any other major city. Savannah urban design is overwhelmingly utopian, despite there being dystopian flavors as well. The main streets force cars to either park or drive around the eleven park squares (circuses), while pedestrians can go straight through on sidewalks and bike lanes. It is easy to find any place in the formal city because there are no diagonal streets, one tall building in the middle (DeSoto Hotel), and a few tall buildings downtown parallel with the Savannah River. 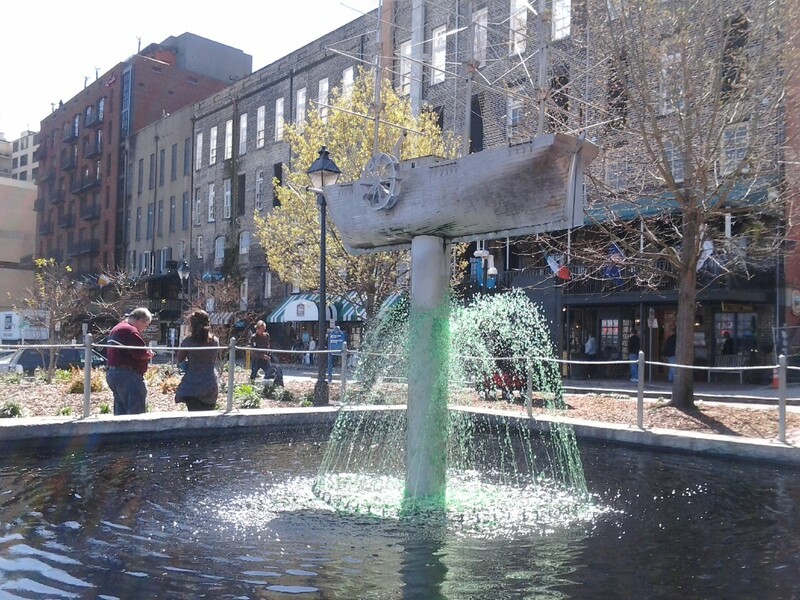 The downtown main-streets (River Street) on Saint Patrick’s Day are celebrated on par with Mardi-Gras. There are so many unique aspects to Savannah, from its very origins. The basic ‘Roman encampment’ grid urban layout is flavored by multiple circuses with vegetation. Live-oaks, palms, and crepe-myrtle trees are naturally hung with Spanish moss. From sandy soil hedges, herbs, flowers and grasses are also publicly grown for the enjoyment of all. I will find out more about the city founders, besides Oglethorpe; specifically the Native American chief of the local Creek Indians, because he seems to deserve the same level of respect as the English founder, Oglethorpe. The British and Indians were friends, and one of the largest monuments in a prominent park is dedicated to the Indian Chief’s grave. Southern hospitality is less surface courtesy in Savannah, and more a part of its essence; in regards to integration of whites and blacks, international representation, multi-culturalism, and willingness to welcome even enemies (like General Sherman during the Civil War). There are several ways to consider the social types that comprise the ‘daily population’ of Savannah. There are five basic social types; the rich residents (white blue-blood aristocracy and new-money millionaires), the poor working-class (merchant and service residents and workers), the street beggars (homeless, hustlers, artists), SCAD students (artists, professors, staff), and tourists (pedestrian, trolley, horse-buggy). According to Dr. Hsu-Jen Huang (SCAD Architecture Professor), Savannah has been growing, even during the recession. In ten years, the city population and SCAD enrollment have doubled. Some buildings still fall between the cracks, but for every loss two more renovations or new constructs emerge. After the 1994 book Midnight In the Garden of Good and Evil, Savannah has continued to blossom as one of the best cities in the World. Many of its qualities were always inherent in the original urban design, and it continues to grow because of accepted differences. From the American Revolution, to the Civil War, and beyond; Savannah embraces its strange stories. It has an other-worldly, old world, old town feel. Ghost tours are quite at home with the lamp-lights, cobblestone streets, brick walkways, and French ironwork balconies. It is in fact a small city; one which favors pedestrian traffic more than automobiles. The whole downtown is walkable, and locals often easily commute with bicycles as well (as I did for 3 years). There are so many fun things to do there, it might be hard to know were to begin; if Savannah were not an immediately immersible, hospitable environment. The whole city is a memory garden, which literally blooms because of all the flowers. There are less flowers and leaves in the Winter, but Fall, Winter, and Spring are best weather-wise; as there is rarely snow, and Summers are often walls of heat and humidity (which it is known for even during Fall and Spring). 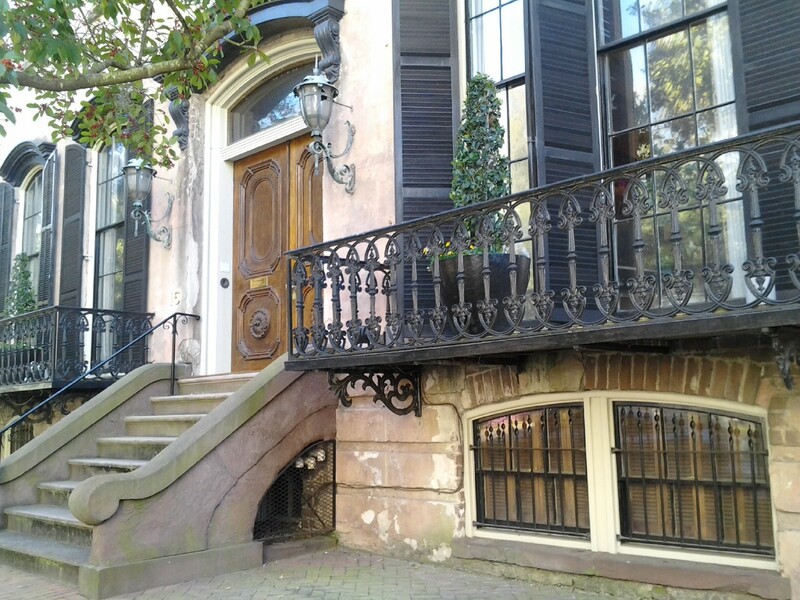 Architecturally Savannah is truly unique, with historic world and southern romantic blends. Town-houses often have the side-porch design, as with nearby Charleston, SC. The cast-iron railings and french dormers have that New Orleans feel. Parks and trees really do make a huge difference for traffic. Even while continuing to grow, Savannah is still one of the most colorful and pedestrian friendly cities in America. I can say after living there, the magic is real; including the variety of character personalities that the famous book alludes to. Midnight In the Garden of Good & Evil describes much of the architectural and social feel of the town. ‘Midnight’ the book has much more analysis of detail, while the film has literally has more visual images. I lived in three parts of town, and often passed by famous landmarks on daily commutes to classes. The main character’s house (Mercer Mansion) is on Bull Street along a square, towards the largest city park, Forsyth Park. 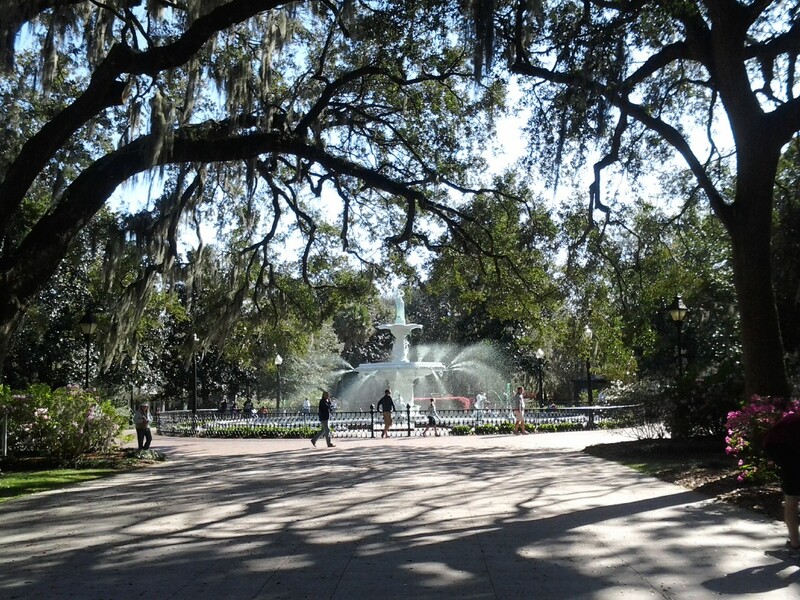 Forsyth Park was my favorite park that I loved living on, because of the large open grass lawns, largest and most beautiful fountain, organic paths, and shady flora. There I was free to publicly practice Tai-Chi, hippy folk music, or jogging without much bother. Most of this essay describes the utopian aspects of Savannah, but this paragraph should put some of the dystopian perspectives in context. The poor and the dead, out-number the rich and the living. Southern swamp-lands naturally have a salty entropic power that corrodes metals, moisture that promotes the decay of organic matter, and massive humidity that stifles productive activity, while encouraging roaches and gnats. The humane social ‘decadence’ of the town, allows for an ease of poverty. Kindness tolerates and sometimes falls prey to hustlers. Vandalism and theft are common crimes in Savannah, with the occasional mugging (typical of cities in general). Although crimes are committed by lower classes, the majority (which are poor) are respectful, lawful, and often generous. So you see despite the ‘scariness’, actual dangers are minimal for a city. Savannah’s name appropriately indicates the climate heat, and the flat field look of the surrounding wetland marsh grasses. Old pirate maps referred to the lands inland along the River as ‘Savannah Land’. Google Street view is very impressive, with realism. It really helps get the feel for the freedom of moving through the town by photographic vista. In the 1990’s we were taking panoramic photos for architecture projects so it really feels appropriate. Day trips easily include the famous Bonaventure Cemetery, Oatland Island Wildlife Center, and Tybee Island Beach. American architect, Frank Lloyd Wright, borrowed the word ‘Organic’ from his mentor Louis Sullivan. 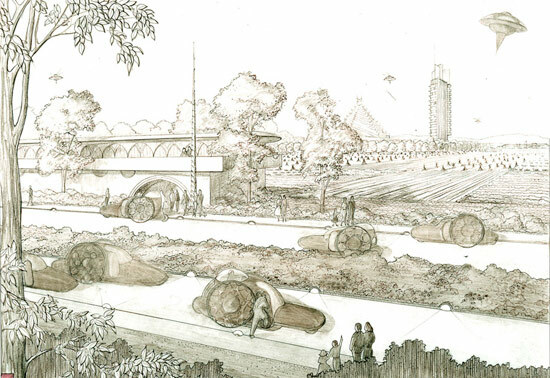 Wright began expressing his own vision of how organic nature applies to design. He tried to define ‘Organic Architecture’ in words, but the truest expression will always be in his designs and how they relate to the landscape. Frank Lloyd Wright formed the Taliesin Fellowship dedicated to organic design, education, and spiritual theory and practice. 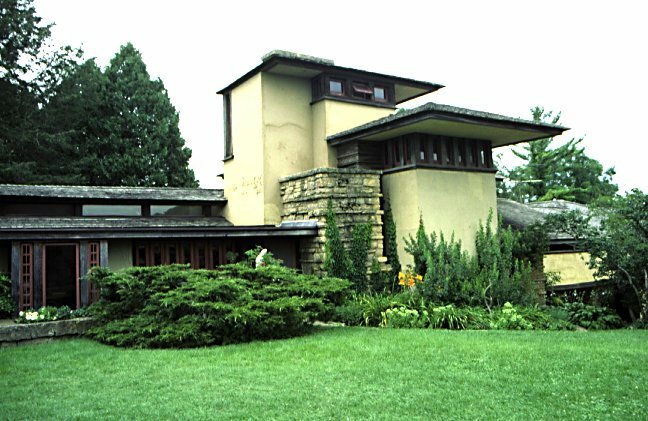 It later evolved into the FLW Foundation, and Taliesin Architects continued after Wright’s death. 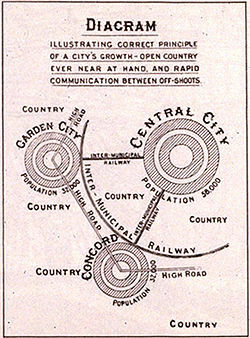 Wright built two small Communities based on his designs and theories. Taliesin East was built first on 600 acres in Wisconsin. 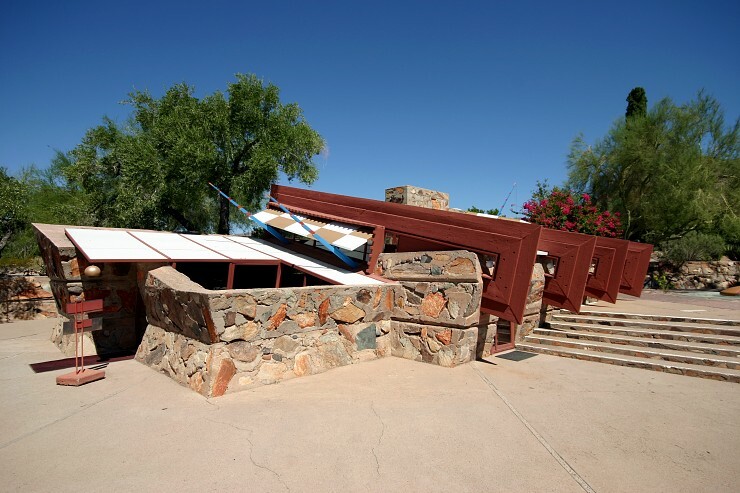 Then Taliesin West was built on 600 acres in Arizona. Both developments respected the landscape by leaving much of it natural, while fitting in artistic architecture using site features. Both remained in a constant state of evolution during Wright’s lifetime. 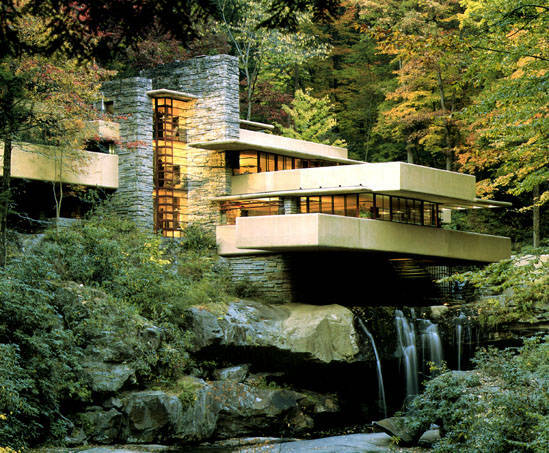 Fallingwater was a unique residence designed by Wright which show-cases his Organic Architecture. The natural organic landscape meets his organic designs above a waterfall. I was awarded a student residency there in high school, and every day for weeks we went down to the cold waters of Bear Run to wake up and begin our sketches and studies. Inside the house, concrete rests on stone, and the woods are seen through generous windows. That house has more of a give and take between the architecture and the landscape (including the water) than most other modern buildings in the World. Broadacre City was designed to show how various types of buildings should be organized in urban planning, using Organic Architecture. 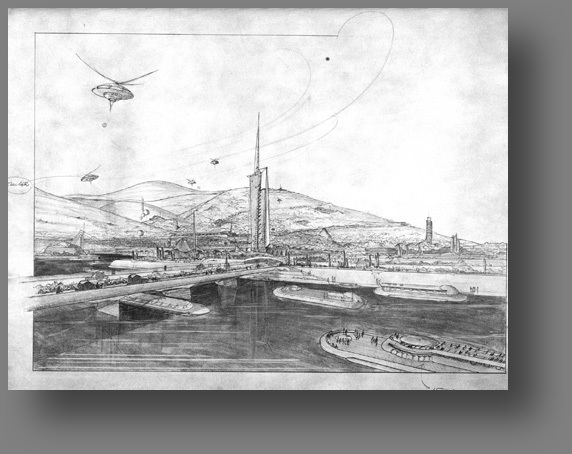 The hypothetical City was 4 square miles and published first in his Disappearing City, 1932 and continued to evolve until his death in 1959. One important rule was that the tallest buildings (sky-scrapers) should have enough open space around them so their shadows do not fall upon other buildings. 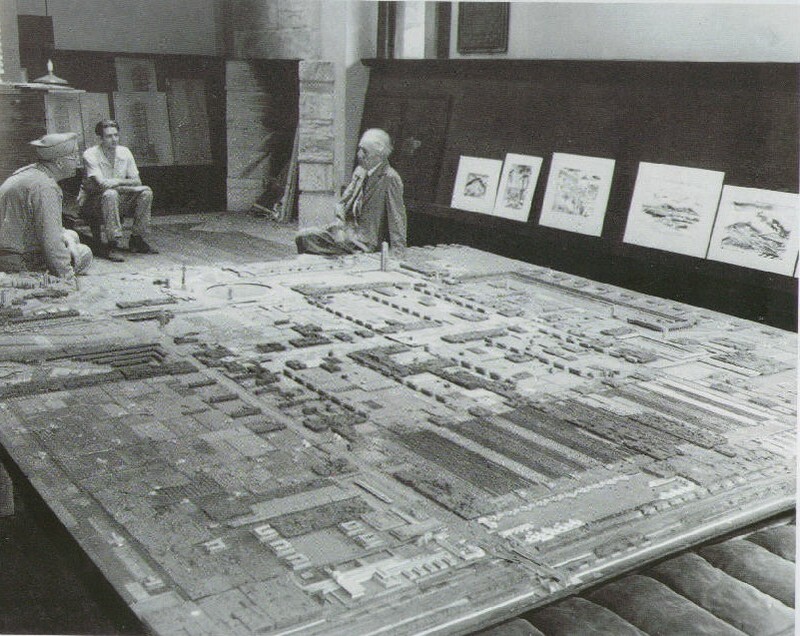 Another factor was giving most residents one acre to build their own houses based on Usonian models. It was an effort to take the new concept of suburbs to a Utopian extreme by furthering the concept of combining rural and urban while striving to keep the best of both. Broadacre decentralized urban design, and lay grid upon rural country; advocating that the desire for suburban life be fully granted. Mass transportation would still be available at stations, but freedom was maintained through the use of individual vehicles on the roads and in the air. 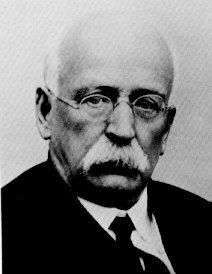 Ebenezer Howard was a shop keeper’s assistant, farmer, writer, sociologist, and statesman. Howard valued good living conditions, democracy, nature, human rights, and personalities. Howard lived in England and America (London, Nebraska, and Chicago). Osburn and Mumford added notes that introduce, critique, review, and praise Howard. JH Osburn claims Howard may have been influenced by Bellamy’s book Looking Backward. According to Lewis Mumford, Howard was also inspired by Spense, Buckingham, Wakefield, George, Kropotkin, and Howard’s wife Elizabeth Ann Bills of Nuneaton (who loved intellect and country-side). Howard’s narrow building lots were handed down from medieval English dimensions (20 x 130 ft). 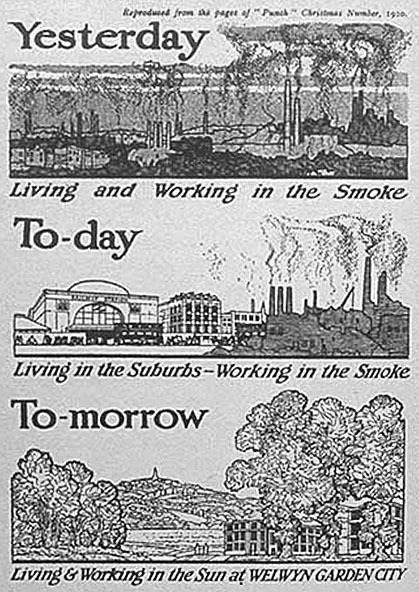 Garden Cities of To-morrow begins by describing the “Three Magnets”: Town, Country, and Town-Country. Howard explains why we are attracted to the best of both Town and Country aspects. Town-Country benefits have cooperation, beauty, nature, green fields, green parks, good utilities, good commerce, social opportunity, high wages, low rents, low price rates, and low pollution! 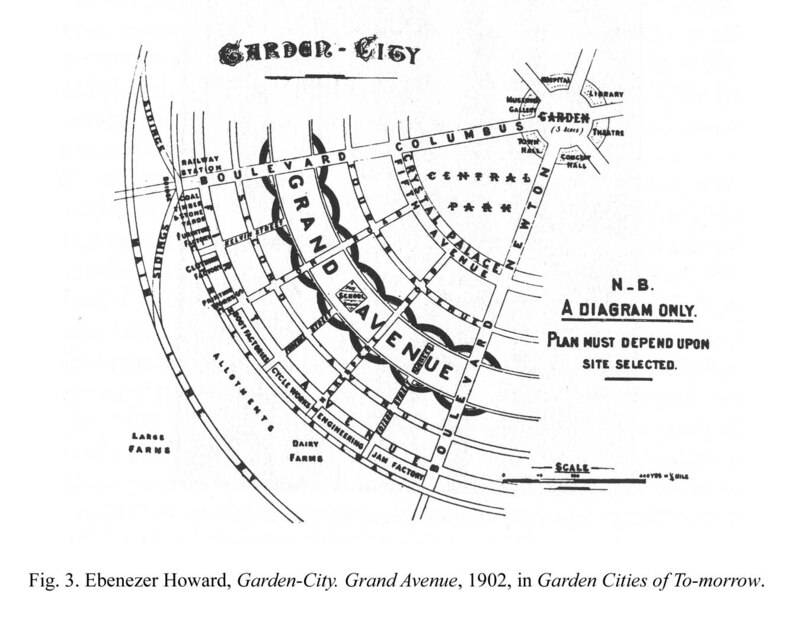 In most chapters, Howard proposes how Garden Cities would function with diagrams. He describes inter-connected urban nodes. Central City is shown with a constellation of satellite micro-cities (garden cities, towns, villages, developments). 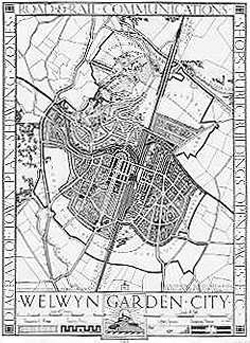 Garden Cities at their heart have a central garden, with rings of dwellings, shops, roads, industry, fields, and farms. The ordered layout is meant to improve biological, social, economic, and personal life for everyone. Howard considered some difficulties with analytic self-criticism. He saw the weak points in his plans, and how they might fail. This foresight can allow us to prepare for the worst problems, to better shape designs for the future. He maintained that human ideals are worth trying; quoting Darwin “Selfish and contentious men will not cohere, and without coherence nothing can be accomplished,”. Howard believed that Socialism and Individualism must come together in the future to realize a true, vital organic society and state. 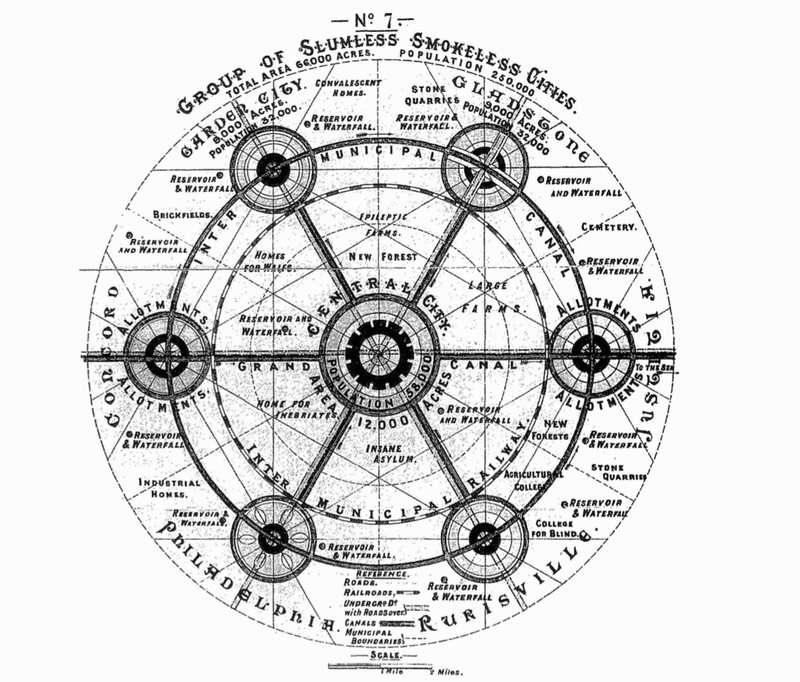 Ebenezer Howard felt that Garden Cities would work, because the plans were based on understanding human nature. He indicated that Urban or Communal failures are a result of the ‘Duality Principle’ (Janus). Ignorance of the Duality Principle allows kindred mistakes, by regarding one principle action to the exclusion of others. Howard believed we are all communists to some degree, even those that shudder at being told this, because we believe in roads, parks, and libraries. Individualism is no less excellent, in his mind, as he compares good society to an orchestra that plays together, but practice separately. Expense, however, always tends to get in the way of progress. Sir Raymond Unwin worked with Howard. 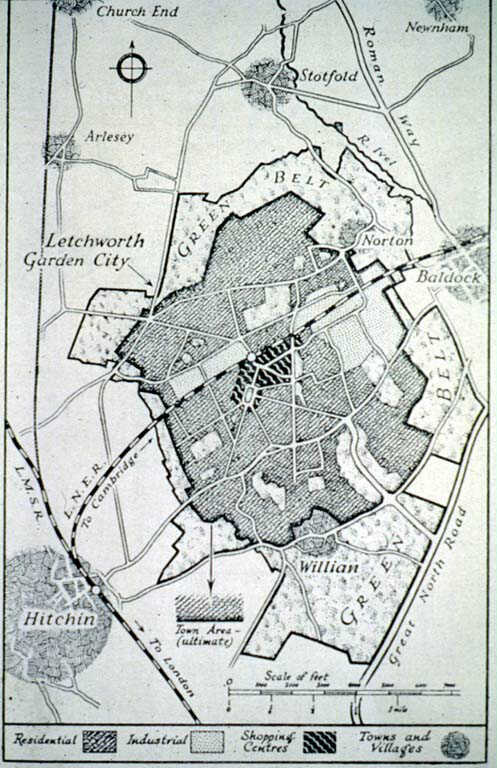 In 1903 they designed and established the first Garden City in England, named ‘Letchworth’. Letchworth proved a success, and in 1919 the second Garden City ‘Welwyn’ was founded. By 1950 the cities had a combined population of over 40,000. The account of their success is given in Purdom’s Building of Satellite Towns. Some key points regarding the study of Garden Cities are: how urban and rural districts connect, health and sanitation, zoning limitations of density and sprawl allowing light, gardens, and leisure, harmony rather than standardization, communications, ownership and cooperative leasing, public freedom and choice of enterprise. Contemporary critics dismissed “Garden Cities” as more akin to the fantasy of H.G. Wells, than to the realities of urban planning. Despite the critics, Garden Cities of To-morrow is cited in countless planning bibliographies, and provides an organic alternative to bleak industrial future city-scapes. So what happened? Our suburbs in America do not follow his models, although some are better than others. Howard wanted to keep the city, town, and country distinct from each other, unlike amorphous suburban sprawl. He wanted more green around and in cities, by confining and condensing urban development, to keep the country rural, pastoral, and agrarian; yet integrating their foundations for healthy and function living.